Harlem School of the Arts Visual Arts Department, The National Associaion of Women Artists (NAWA) present SHELTER 2018, an exhibition featuring member’s creative works in painting, collage, sculpture, and mixed media by women artists. One of the basic needs, with food and love, SHELTER is a major concern for all living beings, especially when it comes to refugees, immigrants, those struggling to pay the rent, and victims of domestic violence. Artwork centered on SHELTER, open to the artists’ interpretation, aims to bring light to the struggles in the search for this essential ingredient for happiness and security. The exhibition will be on view March 1, 2018 through March 31, 2018 free and open to the public. The National Association of Women Artists (NAWA), the oldest women’s fine art organization in the country, is a vibrant community of professional women artists that strives to support its members and women artists at large through exhibitions, programs and education. NAWA members represent all areas of the visual arts including painting, sculpture, photography, print-making, encaustic, video art, installations and mixed media. 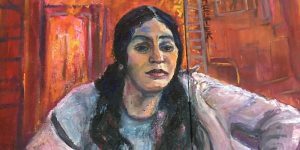 The history of NAWA is a testament to the strength and resilience of a group of strong women who would not accept being shut out of the art salons, galleries and art exhibitions open to male artists during the 19th century. In 1889 their founding of the organization that subsequently became the National Association of Women Artists, Inc. proves that, despite adversity and discrimination – which many feel extends to this day — women are an integral and valuable part of the arts community. For more information about NAWA please visit www.thenawa.org. Violence Transformed is an annual series of visual and performing arts events celebrating the power of art to confront, challenge and mediate violence. Based in the center and surrounding neighborhoods of Greater Boston and drawing upon the creative energies of artists throughout New England, Violence Transformed documents the ways in which our diverse communities harness art’s potential to effect social change and materially transform our environments. Violence Transformed also represents a unique collaboration among artists, activists, museum professionals, academics, and community service providers from diverse segments of the greater Boston area. For more information about Violence Transformed and this year’s calendar of visual and performing arts events, please visit our website: www.violencetransformed.org.